I am always, ALWAYS on the lookout for a hand cream that makes my hands feel super soft but not greasy. Mario Badescu Fruit and Vitamin A&D Hand Cream delivers. A blend of Vitamins E and A oils, lemon peel extract and orange peel wax work to nourish, smooth and refine dry skin. And, since I spent the end of winter and beginning of spring back in Cleveland recovering from my broken ankle -- complete with snow and freezing temperatures -- my hands were definitely extremely dry! I needed a hand cream that would whip them into shape, pronto. Enter this lifesaver by Mario Badescu. One dime-sized dollop of this sweet-smelling cream squeezed out of the pop-up top leaves my hands feeling like silk. There's no greasy residue left behind, either, which is always my number one pet peeve with hand creams -- how are you expected to work on your computer, scroll through your phone, run your fingers through your hair, with grease left all over your hands and fingers? So I love that this one just sinks right in and all that remains is moisturized, super soft skin. Now, I know this hand cream is really more of a peach hue than a pink, but it's just too good not to include in this series. And it's really just a bonus that this hand cream is packed with SPF 10, too -- so not only does it nourish the skin, it protects it simultaneously. It really just takes all the worry out of making sure your hands are happy and healthy! 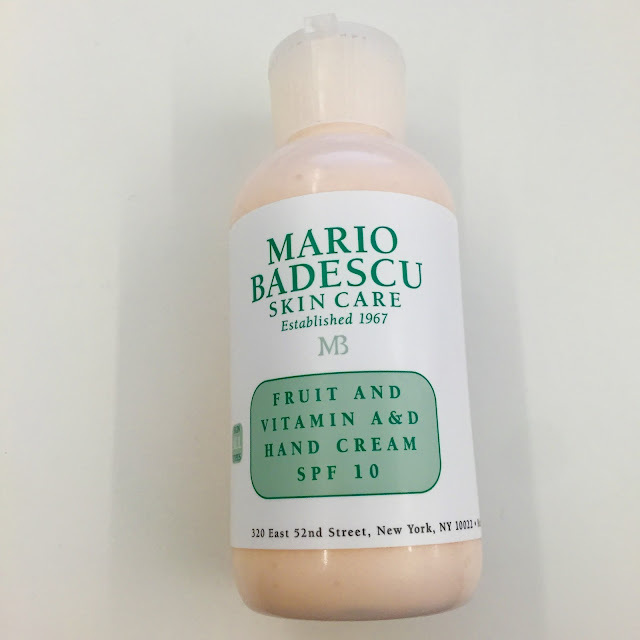 Mario Badescu Fruit and Vitamin A&D Hand Cream SPF 10 retails for $10 at mariobadescu.com. I like that it has an spf. I'm glad that this worked so well for you. I give you permission to use this on Pink day. It sounds great. Is it very scented? I have issues with scent, but sometimes I can overlook the scent if it's worth it! Oh - this sounds really nice... especially on a Pink Day :) It's been years since I Have used anything from Mario Badescu. I have always been a fan of MB!